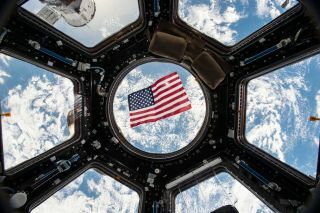 An American flag floats in weightlessness, with the Earth as a magnificent backdrop, in this photo from the Cupola observation room on the International Space Station taken by NASA astronaut Kjell Lindgren. Even the International Space Station has a local polling site, thanks to a Texas law that arranges special absentee ballots for U.S. astronauts who are in orbit on Election Day. In order to vote from space, astronauts request a special absentee ballot about six months in advance, according to NASA. On the big day, they file their ballot electronically through a protected system. The process has been in use since 1997, when a U.S. astronaut voted from aboard the Russian Space Station Mir, which preceded the International Space Station. This Election Day, just one U.S. astronaut is aboard the space station, Serena Auñón-Chancellor. She did not respond to a request for comment through NASA's press office about whether she would be voting from space. A second NASA astronaut expected to be voting from space this year but now isn't. Nick Hague, who was scheduled to fly to the station in October for a six-month stay, told Space.com through a NASA spokesperson that he had requested an absentee ballot in preparation for being off Earth on Election Day.